Published: Fri, March 15, 2013 @ 12:05 a.m.
Tom Hill, regional supervisor for the Ohio Department of Natural Resources, discusses environmental issues concerning CNX Gas Co.’s Blott Road well in Jackson Township at Thursday’s commissioners’ meeting. Members of the public and anti-fracking activists were turned away from the Mahoning County commissioners’ meeting with no answers to questions about an oil and gas well in Jackson Township. The well, just off Blott Road and operated by Pittsburgh-based Consol Energy, is about three miles from Meander Reservoir — the primary drinking-water source for 220,000 people, including those in Youngstown and Niles. The commissioners had invited three officials from the Ohio Department of Natural Resources to explain an incident that occurred last October when a small portion of the well’s protective casing cracked, creating a 4-foot vertical split near the surface, stoking public concern over environmental contamination. 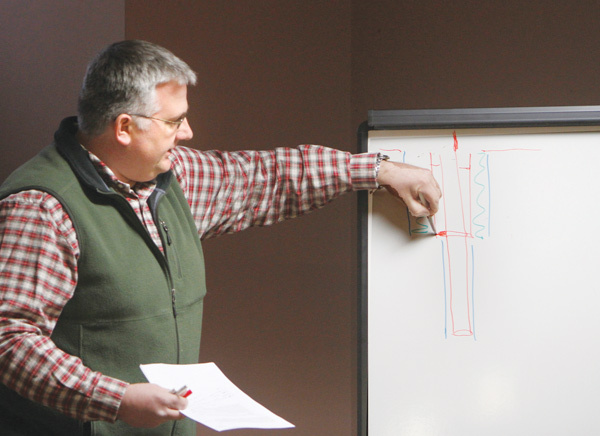 Instead, that explanation, led by ODNR regional supervisor Tom Hill, who oversees a group of well inspectors in the area, became what at times was a perplexing presentation on the science and dynamics of well construction at Thursday’s meeting. What’s more, the presentation was prefaced by Commissioner Carol Rimedio-Righetti, who informed a room full of more than 30 people that the state had requested all questions to be submitted in writing, with answers expected in about 10 days. Activists have been seeking answers about the well for a month. The issue at Consol’s Cadle well, as it is known, came to light when FrackFree first brought it to the attention of commissioners in early February. John Fleming, an ODNR field inspector who was assigned to the site and spoke with The Vindicator after the meeting, explained that during testing on the well casing, a faulty pressure gauge misled operators, who inadvertently forced too much fresh water down it, which led to over-pressurization and the 4-foot crack in the casing. Consol immediately contacted ODNR officials, who assessed the situation and requested repairs be made. No actual drilling for oil and gas occurred, Hill said. The fix was made and the casing was completed to the satisfaction of inspectors, he added. Fracking, or the stage in which pipe is put down the well bore to force pressurized water, sand and chemicals to make fissures in shale rock, began last week at the well site. Casing typically is hollow steel pipe reinforced by cement and installed in isolated sections in a layered fashion. It provides isolated regions of protection between drilling operations and nearby aquifers, or groundwater sources. When asked if the well pad, where the drilling rig rests, was in the reservoir’s watershed, both Fleming and Robert Worstall, a deputy chief of ODNR’s Division of Oil and Gas Resources Management, said no. Holloway explained, however, that other threats exist in the basin such as septic tanks and runoff from parking lots. The Cadle well, in full compliance with state law, is just one more thing his staff will have to monitor, he added.